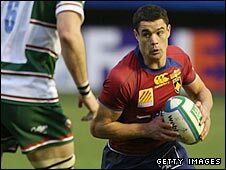 All Blacks fly-half Dan Carter scored 16 points on his debut as Perpignan kept their Heineken Cup hopes alive by avenging their defeat at Leicester. Toby Flood and Carter landed a penalty apiece before the latter converted Gerrie Britz's try to put USAP 10-3 up. Two more Carter penalties made it 16-3 but Tom Croft crossed for the Tigers. Britz scored his second try after the break and although Leicester rallied to 23-20 through Scott Hamilton's try, a fourth Carter penalty sealed victory. Leicester do at least head back to the east Midlands with a losing bonus point which puts them level on points with group leaders the Ospreys at the top of Group Three. The Tigers will head to the Ospreys' Liberty Stadium in the final round of pool matches in late January for what looks like being a decisive encounter. Even without the arrival of Carter Leicester would have travelled to France knowing they faced a difficult task against a side lying third in the French Top 14. Well done Perpignan - the group is wide open and the Ospreys are back in the mix! Perpignan's Stade Aime Giral is a real bear pit down by the Mediterranean in French Catalonia and despite taking an early lead Leicester soon found themselves up against it. Flood opened the scoring with a second-minute penalty but Carter, who was to land six kicks out of eight, replied in similar fashion to notch his first points for the Catalans. The hosts then took the lead with a marvellous try started by scrum-half Nicolas Durand from his own 22. Durand countered from a Flood kick and Carter was involved as the ball went through several pairs of hands before Britz powered through Geordan Murphy's tackle and romped over from 30m. Carter converted and when he added two more penalties it looked as though the hosts were set for an easy victory. But Leicester have been nothing if not dogged over the years and just before the break Benjamin Kayser bullocked his way up the middle, Julien Dupuy went blind and Jordan Crane and Ben Kay sent the pacy Croft over in the corner. Flood added the conversion and when Carter missed a kickable penalty with the last action of the half it meant Leicester only trailed 16-10 at the break. Carter missed a second penalty soon after the restart but the hosts looked like they had made the decisive move when Dupuy was charged down a minute later and Britz grabbed his second try to put daylight between the two sides. However, Flood trimmed the gap with a penalty and then linked with Dupuy to send Hamilton - a former Crusaders team-mate of Carter's - over from a quick tap penalty. Flood's conversion narrowed the gap to three points and with the tension rising the match became quite niggly. Replacement Leicester scrum-half Harry Ellis incensed the home fans and was lectured by the referee for up-ending Carter. But the New Zealander shrugged off the incident and slotted a late penalty as he began his seven-month sojourn in the south of France with a victory. Perpignan: Burger; Plante, Manas, Mermoz, Candelon; Carter, Durand; Chobet, Guirado, Mas, Olibeau, Hines, Britz, Tonita, Chouly. Replacements: Porical for Plante (72), Grandclaude for Manas (56), Pulu for Chobet (62), Kairelis for Olibeau (56), Perez for Britz (67), Geli for Tonita (75). Leicester: G Murphy; Hamilton, Hipkiss, Mauger, Smith; Flood, Dupuy; Ayerza, Kayser, White, Corry, Kay, Croft, Moody, Crane. Replacements: Rabeni for Hipkiss (68), Ellis for Dupuy (68), Cole for Ayerza (55), Chuter for Kayser (56), Wentzel for Kay (58). Not Used: B Deacon, J Murphy.